Accidents are up 18% at intersections where red-light cameras are installed, according to newly-released data. The Winnipeg Sun broke the story on the shocking statistics late Wednesday, which back up the claim that the cameras are not for safety, but merely a cash grab. It’s not the first time that statement has been made. The group Wise Up Winnipeg has been against red-light cameras from the very beginning, as well as many motorists who have been calling for them to be removed. Mayor Sam Katz responded to the data Thursday, saying his first duty of the day was to speak with police Chief Keith McCaskill and get an explanation. 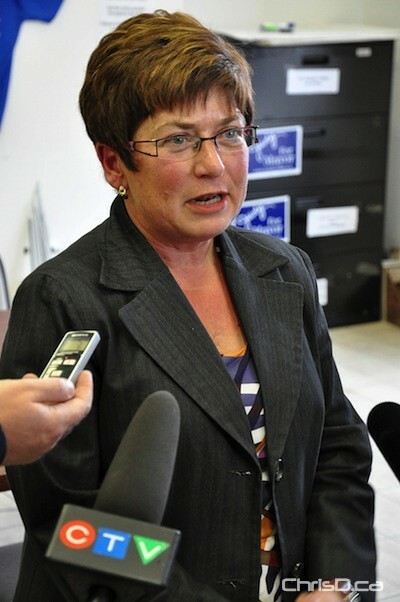 Despite the new information, Katz defended the usage of red-light cameras in Winnipeg. The data — compiled by Manitoba Public Insurance — shows the number of claims made at intersections where the original 12 cameras were installed in 2003 have increased. Mayoral candidate Judy Wasylycia-Leis took the opportunity to weigh in on the issue herself Thursday afternoon during a scrum at her campaign headquarters. The former NDP MP said the red-light cameras shouldn’t be scrapped completely, but the city should review their policy on what could be done better. She also added that if elected on October 27, she would look at the idea of adding an additional second to amber lights at intersections with the cameras. A number of anti-red-light camera groups have said the extra second is critical in reducing the number of collisions where cameras are present. MPI’s data doesn’t measure up to the numbers the Winnipeg Police Service provides, showing accidents have decreased. The data police collect is from when motorists call for assistance after getting into an accident, but police are not always needed when an accident occurs, thus going unreported. The MPI data shows in 2003 there were 204 collisions at the 12 intersections in question, compared to an average of 241 annually between 2004 and 2009. One of the most dangerous intersections with the most collision claims made was the corner of Talbot Avenue and Watt Street, showing an average of 25 accidents the first year the red-light camera went into operation. That number rose to 42 collisions in 2008 and dipped slightly to 40 in 2009. A release from the Winnipeg police shared their own data at the intersections, which shows right angle collisions were down 64.9% between 2002 and 2008, as well as injuries (down 77.8%) and injuries related to rear-end collisions (down 11.8%). Rear-end collisions, on the other hand, have risen by 1.6%. Right angle collisions are those associated with running a red light or speeding in an intersection.